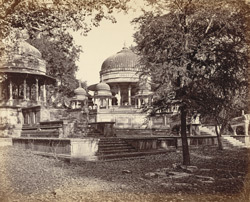 Photograph of Cenotaphs at Kota from James Burgess' 'Photographs of Architecture and Scenery in Gujarat and Rajputana' taken by Colin Murray in c.1872. It gives a view of the Royal Cenotaphs at Kota, with the Cenotaph of Umed Singh in the centre. In 1770 Rao Goman Singh died and passed on the throne to his 10 year old son Umed Singh with Zalim Singh as regent and virtual ruler. Umed Singh died in 1819.